Chips has a number of friends, mostly amongst the faculty at the school. He is content to be in academia, and has dedicated his life to the teaching of classics. This means that he has a limited view of the popular culture of 1924 Britain. When his friend Johnny Longbridge (Michael Culver) invites him to the theater for a musical comedy, Chips doesn’t quite know how to react. It is base and inane, practically moronic. But he puts on a brave English demeanor when Longbridge introduces him to the star of the show, and his hopeful fiancee, Katherine Bridges (Petula Clark). Bridges is immediately enamored of Chips’ fashion of accidentally insulting everyone in the acting world. Later a chance encounter among the ruins of ancient Greece brings Bridges and Chips together again. His utter lack of pretension charms Bridges, and soon she is pursuing a relationship with Chips more quickly than he would ever contemplate. Their romance blossoms and they are married. Soon Bridges is causing a stir at Brookfield, as the unorthodox remainders of her former Bohemian lifestyle is a bit much for the uppity British academics. A variety of obstacles face them for the remainder of their time together, as they age and fall even more in love. This is all presented in a subdued manner, languidly and slowly. The film moves slowly at times, then suddenly leaps forward in bounds to progress the story. This occasionally makes the film uninteresting and dull. Fortunately, O’Toole is remarkably disarming and charming as Mr. Chips. The contrast he brings to Bridges’ parties with her actor friends is often humorous. Fellow actress Ursula Mossbank (Siân Phillips) also is impressed with Chips, and plays a vital role in dismantling some blackmail threats against Chips later in the film. 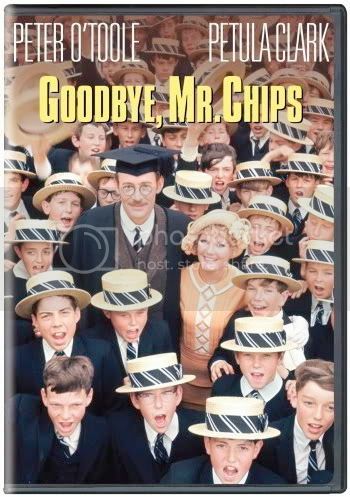 Even though the plot is expansive and choppy, with a smattering of bizarre songs sprinkled throughout (these are often used as inner monologues, but many are half-spoken and half-sung, and often are disembodied singing voices overlaid on the actual actors), the character of Mr. Chips is sympathetic enough to maintain the audience’s interest. He is sort of cute in his awkwardness, saying the wrong things at the wrong time simply because he doesn’t know any better. He is the epitome of the utter lack of pretension. He doesn’t pretend, doesn’t put on a facade, but is simply an old-fashioned academic nerd who argues over the legitimacy of the word “suitability,” which is only in Webster’s and not the Oxford English Dictionary. As Mr. Chips softens in the view of his students, thanks to the presence of Bridges, so does he soften in the eyes of the audience. He becomes more sympathetic and their romance becomes more endearing as the film progresses. Despite being two and a half hours long, the film left me with a pleasant aftertaste. It has its problems and occasionally feels like a romantic epic, but O’Toole as Chips proves rather delightful. His slow change from a stodgy British school master into a beloved teacher and husband is believable and pleasant, and will bring a smile to the face of anyone patient enough to stick with the film.